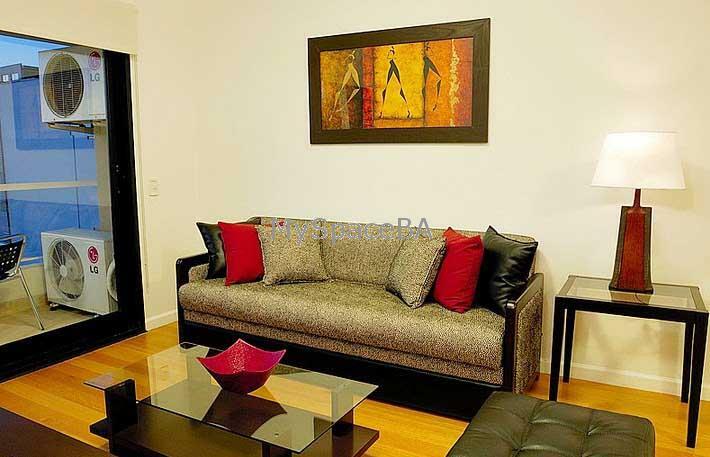 This upscale one bedroom apartment is located on the sixth floor of a luxury brand new building . The apartment is sunny , quiet , modern , precise design , color and fresh. It offers a large living room with a comfortable sofa , TV LCD with cable . Aircon . Guest toilet . Also it has a dinning area with a glass table and chairs for six people . Separate fully equipped kitchen . The bedroom has a walk in wardrobe with an ensuite bathroom , it has a Queen size bed which can be split into two large single beds. Aircon . Balcony . Internet access . Wi-Fi . LCD TV with Cable . CD Player . Aircons . Landline telephone . Cellphone . Convertible sofa . Kitchen with refrigerator with freezer , microwave , coffee machine , electric toaster . Hair dryer . Brand new luxury building . There is 24 hr security . Elevators . The building offers an outdoor large swimming pool and paddling pool located on the ample rooftop terrace offering amazing panoramic views of Buenos Aires. Also sauna , jacuzzi , gym , Parilla (BBQ area) . Surrounded by a selection of Buenos Aires’s most famous and finest restaurants, bars, and pubs, chic boutiques, art galleries, outdoor cafes, bakeries, and a variety of other specialty shops and services. Included: All the bills are paid by the owner .